So many interesting happenings in food and drink .. so little time to discover them. Diva Foodie finds it for you! We go ’round the digital world for the best and most interesting news in food and drink. Some are fun stories, others are important trends. This week we’re highlighting the newest and cutest in food films that stars Winston a Boston Terrier, college and dorm food .. it aint what it use to be (!) and the much loved treat — Twinkies. Cute Puppy + Food + In A Disney Movie Oh My!. Buzz is there’s a hit about to happen and new star about to be born. Feast isn’t even a full length movie but a short. 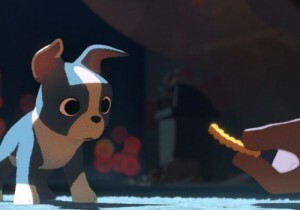 The new star is a precious cartoon Boston Terrior named Winston. The short follows the story of Winston’s life and his relationships through the lens of food .. including his passion for all things junk food like pizza, french fries and nachos. It’s even a french fry that brings this stray pooch to his people James. Feast was directed by Patrick Osborne at Walt Disney Animation Studios. The short will introduce the animated film Big Hero 6 opening on November 7th. We hope you like action adventures about robotics because it seems that’s the only way you’ll get to see Feast. Can’t help but wonder about the product spins. Several directions to go from Winston to food and food related products. What a way to begin the holiday present-giving season! Beyond College Pizza and Junk Food What are your memories of campus dining service and dorm food? How about pizza, beer, ramen noodles, what can be cooked in a mircowave, coffee and the proverbial vending machine junk food. Did I mention pizza? Not so much anymore. Higher ed has gone high gourmet. The Daily Meal reviewed 2000 colleges and universities leading to a final list of 2014 75 Best Colleges For Food in America. And the winner is Bowdoin College, Brunswick, ME. By the way, this Boston native loves the lobster night at Boston University (#10). Add one more to the college criteria list: Food. Twinkies and DingDongs Coming Back! Formally known as … Hostess Twinkies and Ding Dongs may not be on Mrs. Obama’s Let’s Move list of approved school food but it was a special lunchbox treat for millions of kids. In 2012, Hostess Brands filed for bankruptcy. Recently Hostess Brands Inc. was approved, by a bankruptcy judge, to sell Twinkies, Ding Dongs and some other of its brands to Apollo Global Management and Metropoulos & Co. for $410 million. The goal is to have Twinkies on grocery shelves in time for your 2015 summer picnics.